We are all becoming more conscious of choosing the organic option to avoid all those nasty chemicals, but did we know that the organic option isn’t only for food? What we put on our skin is just as important as what we put in our mouth, yes, organic skincare is an option! But why exactly would we want to do that…..
Let’s look a little deeper into the word “organic”. When we say a product is organic it means that it is free from synthetic additives such as chemicals, dyes and is produced by an organic agriculture. The ingredients were farmed using organic farming methods that recycle sources and promote biodiversity. ….to put it simply, it’s all natural! Now why would we want to use that label we don’t recognise in comparison to that amazing designer product we purchased from Myers that makes our face smell like roses? Let me tell you why. If I asked you to eat that rose smelling cleanser…would you? How many of us have spent the time to read the ingredients in our skincare? Most of these mainstream products contain chemicals that the skin easily absorbs and carry into our blood. This can be the main cause of allergies and headaches. Before chemicals and any synthetics were introduced to our skincare all we had were ingredients from the earth and it was all we needed (and still need!). Our bodies recognise these ingredients, it’s not a shock to our skin, it’s familiar with them. Now if you were to eat an organic product you would be eating what the earth created. If you were to eat that rose smelling cleanser however, you could be ingesting chemicals like Formaldehyde, Fragrance, Parabens… the list goes on & you would be sick! Now I’m not saying to go start tasting your skincare range, but I am saying if you don’t know what it is and it is not labelled “certified organic” put, it, DOWN! Whether it’s aging, acne, fine lines, pigmentation, texture, dull skin, there is an organic certified product that can assist you with your skin concerns. After all, our skin is the largest organ in our body, so let take care of it. So it’s time to relax and book in that fortnightly facial. Have you ever wondered what they are actually using on your beautiful face? If you are not visiting an Organic Salon, its likely to be loaded with fragrance, chemicals and ingredients that can often do more harm than good. I have worked as a therapist for many years in clinics and salons I’m sure you all have had a treatment in. It wasn’t until the repeated questions from clients about skincare, that I found myself spending hours researching ingredients. This led me to study organics and wonder why are we using all these chemicals on clients when in fact, they have no benefit at all. The answer to this could be a number of things. The ingredients are cheaper, the smell is stronger, it takes less time to make and most the time they choose to spend the time and money on branding the product to make it appealing to the eye rather than appealing to the skin. When trying to source clinics that offer organic therapy in Sydney, the options were extremely scarce. This upset me for so many reasons. Organic’s is a conversation that the world is having every day and unfortunately we are not all up to date. It’s important for organic therapist to educate their clients but when there are so little organic therapist, education isn’t at our fingertips. After years of research and writing numerous blogs to help clients achieve better skin, I finally decided to open up my own Organic salon, The Vitalounge. 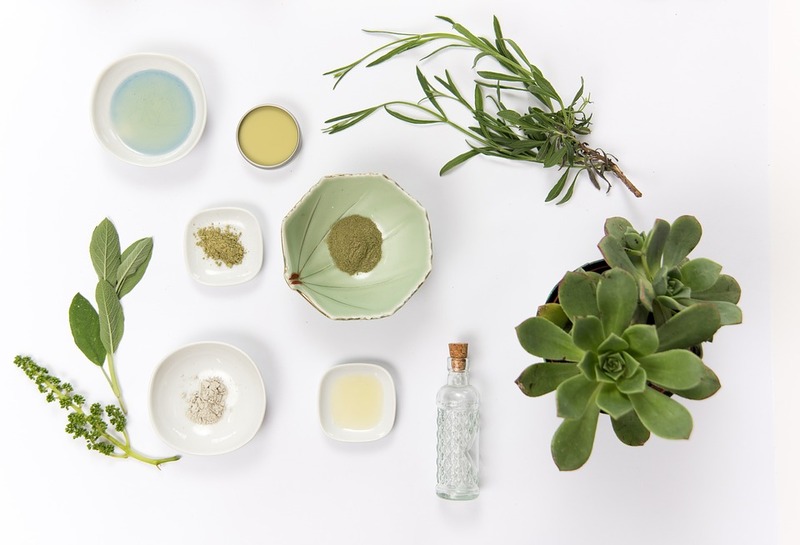 Located in Sydney’s West, it is the first Organic Based salon offering a range of treatments to not only leave you feeling fresh, but leave you feeling confident on the fundamentals of Organic skincare. Whether you are a local to The Vitalounge or living in beautiful Bondi, I urge you to resource an Organic based salon and pick that therapist’s brain! That’s what we are here for, we are excited to answer your questions. Knowledge is the key to beautiful, clear skin. So we now have a clear idea about what “Organic” means and defining an Organic product, but what ingredients can we expect and what should we realy look out for? The ingredients you can expect depends on what we are trying to achieve with our skin. Dry & Dehydrated – Aloe Vera, Borage seed oil, Mango butter & essentials oils such as frankincense, sandalwood and carrot seed. Oily – Rosehip seed oil, honey, activated charcoal, Dead Sea mud & essentials oils such as thyme, lavender and tea tree. Sensitive – Almond oil, chamomile, jojoba oil & essential oils such as rosehip, lavender and neroli. Combination – Argan Oil, Rose Hydrosol, Aloe Vera & Essential oils such as rose, sandalwood and helichrysum. Normal – Aloe Vera, Jojoba oil, squalane & essential oils such as lavender, geranium and carrot seed. This is only a rough guide as there are so many beautiful ingredients derived from the earth to help you improve your skin. If you read a label and don’t recognise something, put that google search to good use! At the end of the day, we all want to look and most of all feel beautiful. Our health is priority, it gets us out of bed each day. Don’t think to yourself “organics are so expensive” because 1, it doesn’t have to be and 2, have you priced cancer lately? It’s a scary reality check but we live in a world where chemicals are everywhere! So let’s avoid it, whether you’re doing groceries or need to top up on that cleanser, choose organic every time. Beauty is more than what we see on the surface, beauty goes all the way down into your liver through your kidneys all the way down to your toes. Let’s stay beautiful inside and out. This blog was written by the incredible Kimberley Devine, who is a an Organic Skin Specialist and Business Owner of The Vitalounge. Click here to Download your FREE The Fast & The Nutritious Smoothie Secrets Ebook!